Hi everyone! Did you have a wonderful holiday with family and friends? My kitty Cheops had a great time playing with his new toys. Santa even brought him a nice cozy bed! 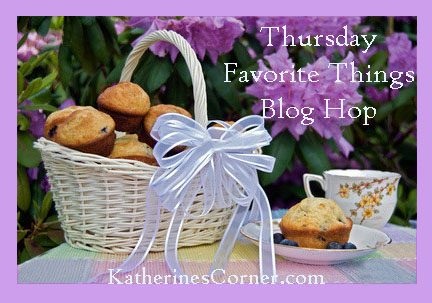 I'm excited today to be co-hosting this week's blog hop at Katherines Corner. Katherine is so sweet and was born on the same day as me, which makes us Scorpios! I encourage you to take a peek at Katherine's blog where she shares recipes, book suggestions and her cute dog Izzy. Now lets get this party started! Follow Katherines Corner preferably through Email it's on her sidebar (or she has facebook, google plus and twitter too). Please follow my blog too! Visit as many blogs in the list as you can and leave a comment. Share the button on your post. Please grab the hop button to share with others, you can copy and paste the image with a link to KatherinesCorner.com or grab the code from Katherines Corner it's on her right sidebar. It's always nice to have the hop button on your post, but it IS NOT mandatory, although a link back to Katherines blog is always appreciated. Thanks for co-hosting Favorite Things. I am about to link up to follow you..would love for you to come over and follow along with Sweet Nothings. Thanks for co-hosting Donna! Love your kitty! 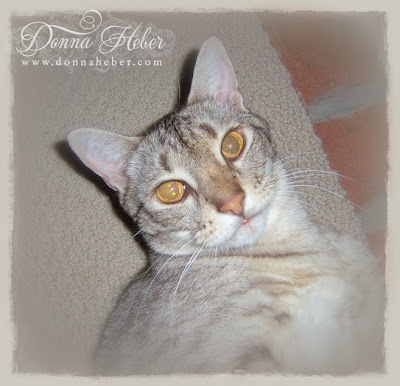 Katherine and Donna...thanks for hosting this blog hop...glad to stop by. Your cat is so cute! Lovely shot! You have a beautiful Blog. I am a new Follower from the Thursday Favourite Things Blog Hop. Thanks for co-hosting and enjoy the rest of the week. All the very best for 2013. You have a very beautiful blog :) Thanks for stopping by my blog and I hope we can stay connected. Have a blessed 2013. You have a delightful blog! I feel like I'm visiting my mother's house because it is so elegant! I had a good Christmas, hope you did too! You have a cute kitty there! I bet he likes his new bed. Delicious cat. Nice photo. Greetings. This is always such a fun party! It's nice to see all of the posts with Christmas pretties! Sweet hugs! This is my first blog hop, thanks for co-hosting. Your blog is beautiful and so artistic. Thanks for hosting the party dear friend :) have a blessed Friday! Hey Donna thanks for co-hosting and visiting/commenting @ LoblollyLane. Lovely blog you have - I'm glad to get to know it!!! Thank you for co hosting this fun party. I love the colors of your blog...very nice! How lovely to be introduced to your blog. Hope to visit again. All the best in the new year! Stopping by from the hop. Your kitty's eyes are really captivating. Happy Holidays. New Linky Follower, found you via Katherine's Corner and am very excited to find such great blogs! Your blog is beautiful Karen.